Since 2009 and surely earlier, the Bureau of Land Management (BLM) has always said they want to sterilize wild horses and burros. BLM and Secretary Sally Jewell want to use other forms of birth control besides PZP even though Congress has paid BLM to let Big Pharma experiment with PZP on our wild mares for decades. At least one pharmaceutical company was hoping to use PZP for human contraception but since it’s not safe for the ovaries and makes wild horses sterile after multiple use, it’s not ideal for a human product. PZP, Porcine Zona Pellucida, is made from slaughterhouse pig ovaries and mixed with adjuvant. BLM never said they liked PZP for wild horse management. The truth is BLM thinks PZP is impractical and they don’t believe it works well. BLM doesn’t want to round up wild horses every 1 or 2 years (for native PZP or PZP-22) and be bothered with drugging wild mares at the “right time” of year. 90% of the herds on public land need to be rounded up to be darted with PZP. Only the ones who are almost domesticated and let people close can be darted in the field. The feds would rather use a one shot deal to sterilize wild horses or just geld (castrate) or spay them and toss them back out to die off and not reproduce. You might be hearing spin and rumors once again from the growing group of BLM collaborators/advocates who used to fight for wild horse freedom but who now fight for PZP. They have invested in PZP as their pillar of management. Some are applying for grant money to monitor the herds on PZP. “If the BLM doesn’t use PZP to manage population for a zero growth then they will sterilize them.” This statement is FALSE. BLM already wants to sterilize them and PZP sterilizes after multiple use. “If the BLM doesn’t use PZP to manage population for a zero growth then they will sell them and they will end up slaughtered.” This statement is FALSE. BLM wants to dispose of as many wild horses as possible. PZPed mares have been seen in the kill pens. “If the BLM doesn’t use PZP to manage population for a zero growth then they will kill them.” This statement is FALSE. The BLM would face a wave of public outrage and protests if they announced plans to kill alleged “excess” wild horses. Then there is the outright lie: “PZP is only a temporary measure to use until we can stop horses from going to slaughter.” No policy the government undertakes is ever quickly undone. If BLM were to start administering PZP to all the wild mares from starting at 18 months old, then this would take years to undo. The herds’ genetic viability would be wiped out. America’s wild horses would be managed to extinction for sure. The coalition working for PZP-based management of wild horses called The American Wild Horse Preservation Campaign (AWHPC) used Return to Freedom sanctuary as their 501c3 fiscal sponsor for donations up until 2016. It seems Return to Freedom has also received a lot of money from BLM in the past. Was that for decades of PZP research? PZP was approved by the EPA in 2012 as a “restricted use pesticide” based on The Humane Society of the United States’ (HSUS the AWHPC coalition member) application stating that wild horses are “pests” and a threat for various reasons. Even the docudrama AMERICAN MUSTANG pushes PZP on their target audience. It was made by a major donor and player at AWHPC. How can they push PZP pesticide on what they say in the film is a native species? Was the footage taken at 1:02–1:08 and 2:13–2:21 of wild horses in the care and control of Return to Freedom while being boarded at the feedlot in Fallon Nevada for close to 2 years? The truth is wild horses are not overpopulated. BLM fraudulently releases crazy population numbers to fool your elected officials into giving them more money to wipe out America’s last federally protected wild horses on public land. You can read more about that here: http://protectmustangs.org/?p=8551 . The NAS report states there is “no evidence” of overpopulation. 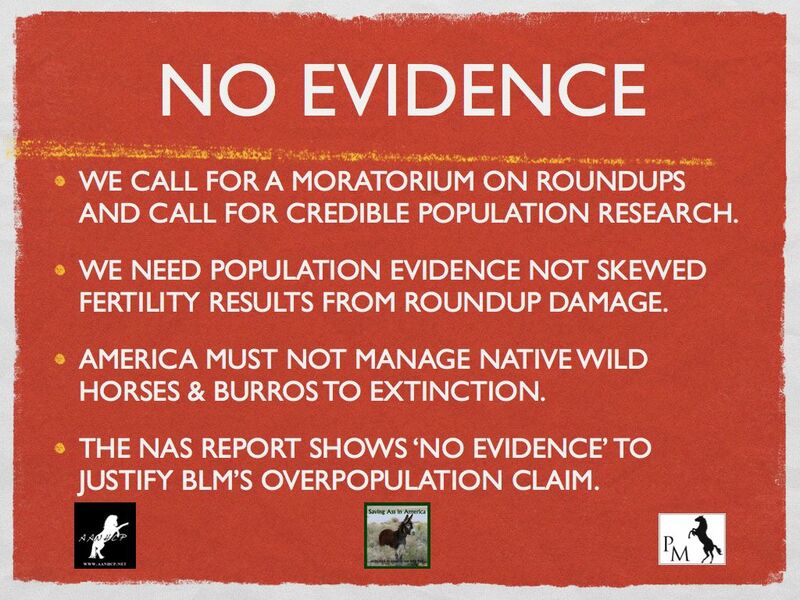 Only tobacco science and spin backs up BLM’s population claim to justify roundups and fertility control/sterilization. Now the Cloud Foundation is enticing their followers to speak out for PZP instead of BLM’s proposed radio collars and sterilization of the White Mountain Herd in Wyoming. What ever happened to speaking out for the federally protected yet voiceless wild horses and stopping BLM from managing them to extinction? Wild horses want their right to real freedom. 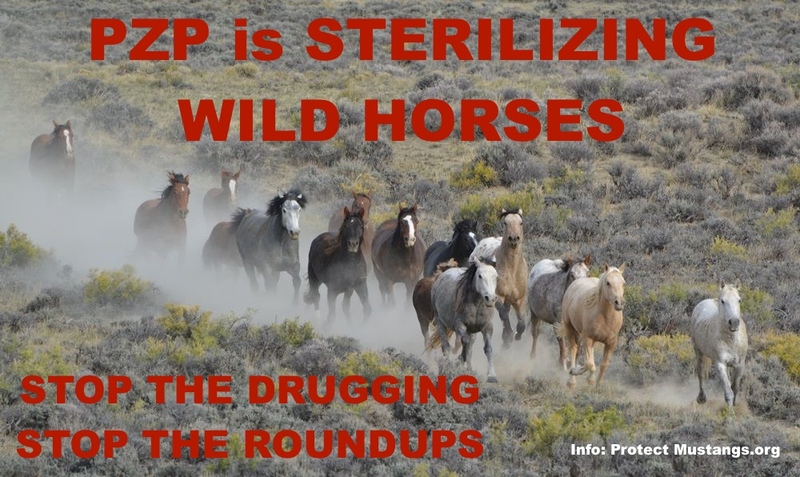 Forced drugging with PZP pesticide is an infringement on the core of wild horse freedom. It violates their right to let nature decide the survival of the fittest, who breeds and tortures the mares who will be raped repeatedly because she isn’t fertile yet comes into heat monthly. Other groups are hoping for grant money to participate in more PZP related research. Accepting the need for any kind of fertility control is a slippery slope because BLM and the Department of Interior will pounce on the opportunity to tell elected officials that the majority of the public wants birth control to fix their counterfeit crisis. Of course this isn’t true. The majority of the American public has no clue that their tax dollars are being used to fund cruel animal experiments and manage a wild species to extinction. Jewell said that by law the horses cannot be killed. The population has grown to about 100,000, with roughly half now in holding pens. “We believe that birth control is a path forward that will help satisfy people that feel passionately on both sides of the issue,” Jewell said. No Secretary Jewell, birth control will not satisfy people that realize BLM has inflated the population data to support their goal to remove as many wild horses as they can. The public feels passionately about wild horses’ right to be protected in the true spirit of the Wild and Free-Roaming Horses and Burros Act of 1971. We don’t want them forcibly drugged up with pesticides like PZP, Gonacon™, SPayVac®, brutally given chemical vasectomies and field spaying for birth control nor do we want wild horses and burros used for experiment and research. Secretary Jewell basically informed the governors that wild horses are overpopulating like rabbits. When she spoke about birth control she wasn’t specifically talking about PZP. The head of the Department of Interior was talking about fertility control, period. She worked as a power broker in the oil and banking industries before her stint as CEO of REI. Jewell’s goal seems to be to maximize resources on public land for profit. Wild horses and burros can slow down profit so they need to be wiped off the game board. Secretary Jewell cast out an open invitation for universities and Big Pharma to experiment on our treasured wild herds with an incentive grant program. The BLM is only out for big money. The federal agency can get more money from mining, fracking, for oil and gas as well as for renewables such as massive dirty solar farms, etc without wild horses out there. The livestock and Big Ag lobbies are strong so BLM must be sure to leave them some crumbs. That’s why the Cattlemen’s lobby feels so threatened to share any grazing space or water–not that they ever liked sharing public land grazing with native wild horses. Despite the fact that the National Academy of Sciences stated there is “no evidence of overpopulation”, a group with alleged funding related conflict of interest is pushing the sterilizant known as PZP on an uninformed public using the ‘it’s either slaughter or PZP’ scare tactic. Today’s drug pitch is found in the Huffington Post: http://www.huffingtonpost.com/suzanne-roy/wild-horses-at-risk-of-sl_b_4934857.html It references population control experiments on the less than 48,000 acre Assateague Island in the East and lacks scientific comparison with the vast open range found in the West–where some herd management areas cover 800,000 acres or more. Why did the coalition of several groups give up the fight for wild horses’ real freedom? Freedom is the American mustangs’ right according to the Free Roaming Wild Horse and Burro Act of 1971. They should not be manipulated by man on the range nor in congressional back rooms. Native wild horses should never be domesticated through sterilizants with man choosing who breeds. That’s nature’s job in the wild. It fosters survival of the fittest. The solution to the fertility control debate is to focus on what the wild herds need to thrive in freedom not what a campaign, driven by a sanctuary or the BLM, wants to achieve. We need good science to find solutions. The BLM wants to eliminate the majority of wild herds to free up public land for toxic drilling so why is this coalition following BLM’s lead to push population control before science? There is no accurate population count to justify roundups. BLM’s overpopulation claims are a farce. What’s the solution for a falsified overpopulation problem? A reality check and good science. Fearing extinction from excessive roundups since the 2009 public land grab for energy exports, America’s wild horse birthrate in the West is abnormally high. That should be a red flag that there is something seriously wrong with ecology on their native range. The Chainman Shale deposit of oil and natural gas in northeastern Nevada and into Utah is about to boom. Exploration began around 2009 in tandem with vast roundups removing the majority of wild horses who have the legal right to be on public land. Some went to probable slaughter and others make up the 50,000 captives warehoused in long-term holding facilities at taxpayer expense. America’s wild horses should live wild and free–not drugged up with “restricted use pesticides” passed by the EPA for pest control and unsafe for domestic horses. We invite the public and elected officials to demand a 10 year moratorium on roundups for recovery and studies to develop good science for management. Wild horses are an essential part of the thriving natural ecological balance. They will help reverse desertification and reduce global warming by filling their niche on their native range. Contact us if you want to keep America’s herds wild and free. Our email is Contact@ProtectMustangs.org We need your help in various ways. Remember the herds are the lifeblood of our native wild horses. Due to underpopulation their genetic viability is in crisis today. American wild horses must be protected from experimentation and from domestication so they can always run wild and free. Protect Mustangs educates, protects and preserves native and wild horses. The nonprofit conservation group strives for a moratorium on roundups and science-based holistic land management to reduce global warming. The Bureau of Land Management and the United States Geological Survey (USGS) have begun a five-year wild horse contraceptive study at the BLM’s short-term holding facility in Pauls Valley, Oklahoma. The pasture breeding study will test the effectiveness of two formulations of the investigational contraceptive vaccine SpayVac® to determine if the treatment can reduce foaling rates in wild horse mares. The goal is to see if SpayVac®, a novel formulation of a glycoprotein called porcine zona pellucida (PZP), will provide a longer-term effect than other PZP vaccines currently used by the BLM. If the vaccine is found to reduce foaling in this controlled setting, it will be considered for use with free-roaming horses to help control population growth rates on the range. As the primary agency responsible for management of wild horses on U.S. public lands, the BLM has a need for a long-lasting contraceptive agent to control herd growth rates. Given the protection afforded by the Wild Free-Roaming Horses and Burros Act of 1971 and a general lack of natural predators, wild horse populations increase at an average rate of 20 percent a year and can quickly exceed the carrying capacity of their ranges. The BLM, as part of its development of a new wild horse and burro management strategy, has been stepping up its efforts to reduce population growth rates in wild horse herds using contraceptive agents. A main limitation of the agents currently available is that they are of relatively short duration or need to be administered annually. Maximizing the duration of contraceptive effectiveness is especially important in wild horses, which in most cases must be captured in order for the treatment to be successfully administered. In the BLM-USGS study, 90 mares have been treated with either one of two formulations of the vaccine or a placebo. The mares will be followed for five years to measure anti-PZP antibody levels and compare the foaling rates between treated horses and controls. Although breeding is not usually allowed to occur in BLM facilities, a clinical trial in this controlled environment will provide critical information on how well SpayVac® works as a contraceptive. 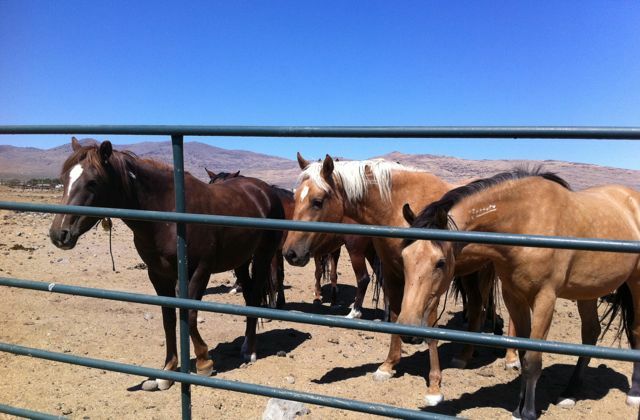 The mares and stallions enrolled in the study were selected from horses already in BLM holding facilities. They are being housed in three 30-acre pastures and will be together during the next five breeding seasons. Foals that are born during the study will be offered for adoption each fall after they have been weaned. At the conclusion of the study, all adult horses will be returned to the BLM’s Adopt-A-Horse Program or placed in long-term pasture facilities. 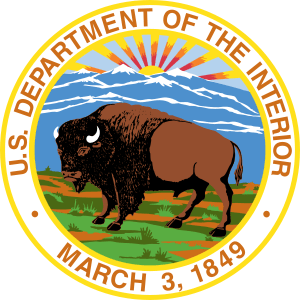 The BLM has an interagency agreement with the USGS for research and scientific support, and this study is a collaborative effort with scientists from the USGS, veterinarians with the Department of Agriculture’s Animal and Plant Health Inspection Service (APHIS), and TerraMar Environmental Research LLC. Is this what the EPA has approved for our wild horses and burros? Has the EPA approved–under a restricted-use pesticide program–a method to terrorize the young and old in a herd rendering the mares infertile as young as seven years old? Who gave the government the right to play God and make the choices? Wildlife depends on natural selection for the survival of the fittest. Are wild horses and burros ruining the thriving natural ecological balance on the range–or is it the livestock? We all know the livestock is the culprit–outnumbering wild horses 50 to 1. How many wild horses are out there? Some Herd Management Areas have as little as 3 horses on them. Where is the scientific proof they are overpopulating? If you don’t like what you see then take action. Re-protect the indigenous wild horse. WASHINGTON (May 11, 2012)—Protect Mustangs, a San Francisco Bay Area-based wild horse preservation group, opposes the Environmental Protection Agency (EPA) categorizing indigenous wild horses as “pests”. This classification would allow the EPA to approve the restricted-use pesticide, ZonaStat-H, for use on wild horses for birth control. Protect Mustangs maintains there is no scientific proof that wild horses and burros are overpopulated on the more than 26 million acres of public land and states that science proves wild equids heal the land—reversing damage and desertification. Today Protect Mustangs has asked the EPA to retract their wrongful categorization and halt the use of the drug. Besides the environmental hazards of using ZonaStat-H, the group is concerned the potentially dangerous pesticide could permanently sterilize and lead to the wild horse and burro’s eventual demise in the West. After decades of research, ZonaStat-H, the EPA registered name for PZP-22 (porcine zona pellucida), has not been approved for human use. China has been testing PZP for years but research shows damage to the ovaries so the drug remains in the test phase. Protect Mustangs is concerned the pesticide will permanently sterilize America’s indigenous wild horses after multiple use or overdosing, and that the use of PZP-22, GonaCon, SpayVac and other immunocontraceptives are risky. 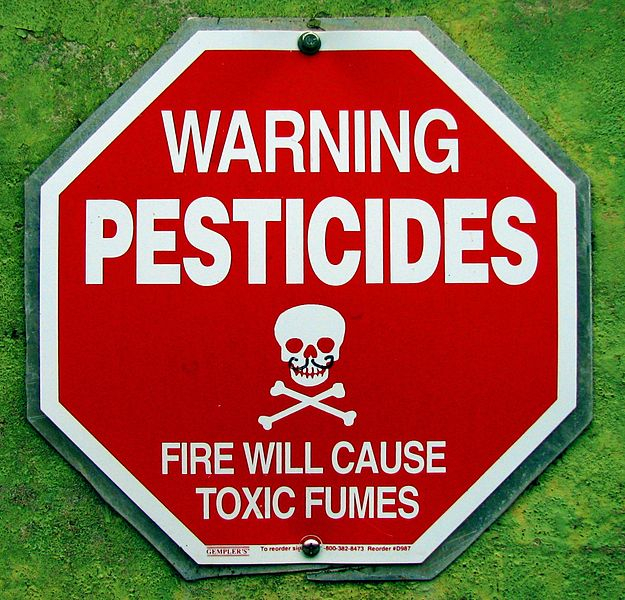 Under provisions of the Federal Insecticide, Fungicide and Rodenticide Act, the EPA can consider nonhuman animals to be pests if they harm human or environmental health. The Savory Institute, a proponent of holistic management, states wild herds heal overgrazed grassland and uses livestock to mimic wild herds to bring the land back to life. Public land grazing allotment holders might call free roaming wild horses a nuisance but they have an obvious conflict of interest—they want all the grazing and water rights for their livestock that outnumbers wild horses 50 to 1. It appears they would like to eliminate the rights of the free roaming wild horses and burros. Protect Mustangs hopes the EPA will not buy into their game. There is no scientific proof wild horses are overpopulating on the range. Despite years of requests from members of the public and equine advocacy groups, the government refuses to make an accurate head count on public land. The Bureau of Land Management (BLM) has been accused of inflating estimates to justify costly wild horse roundups and removals—paid for by the American taxpayer. Indigenous wild horses do not reproduce like rabbits—many die before the age of two. Life on the range can be hard and most wild horses never reach the age of 19. As a wildlife species, this is normal. Left alone, they will self-regulate as an integral piece of the ecosystem. Recent scientific discoveries prove wild horses are native wildlife. The horse evolved here and must be respected as indigenous before they risk extinction at the hands of the American government. Wild horses have natural predators such as mountain lions, bears and coyotes to name a few. BLM goes to great trouble to downplay the existence of predators to foster their overpopulation estimate-based myths. Another frequent argument for the use of pesticides as birth control for wild horses and burros is that they would reduce the need for roundups. However, birth control would not end roundups because it would be difficult to dart wild horses in remote regions and lost darts become biohazards. Trapping in accessible herd management areas and roundups would continue in order to administer the drug. In the early 1900s there were two million wild horses roaming freely in America. Today there are only about 40,000 captured mustangs living in feedlot settings—funded by tax dollars. Due to the government’s zealous roundups and removals, less than 19,000 wild horses remain free in all the western states combined. The BLM is caving into corporate pressure from the livestock, energy, water and mining industries who don’t want to share public land with America’s indigenous wild horses.